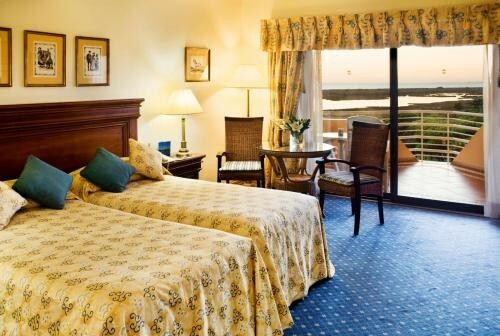 A deluxe hotel overlooking the Ria Formosa and surrounded by 9 golf courses in Quinta do Lago Estate. Facilities include a Wellness Spa, tennis court, an indoor and outdoor pools, and a Fitness Room. Discount rates online. The deluxe Hotel Quinta do Lago with 141 bedrooms and suites is located in the famous Quinta do Lago Estate in the Algarve. The hotel is surrounded by woodland and 4 championship golf courses, with another 7 excellent courses within easy driving distance. The hotel offers quality comfortable accommodation and great facilities in a its beautiful location overlooking the Ria Formosa. 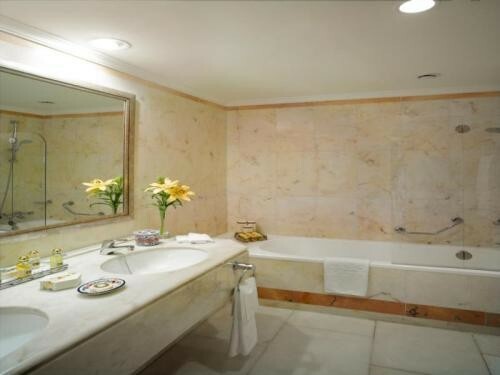 The 5 Star Hotel Quinta do Lago, which is considered one of the Algarve’s one of the leading hotels in the Algarve, offers spacious guest rooms with luxury bathrooms. All of the rooms have a private balcony with views over the river, sea or attractive gardens. The hotel has 2 restaurants, one serving a gourmet Italian cusine, whilst the other serving a great selection of Portuguese and international dishes. Light snacks and drinks are also available in the poolside bar. Other leisure facilities at the Hotel Quinta do Lago include indoor and outdoor swimming pools, tennis court and a Spa. There is also a Kids club and a designated play area. This large room is elegantly decorated and features a balcony with panoramic views. The air-conditioned Double Room with Garden View offers a seating area and a satellite flat-screen TV. This large room is elegantly decorated and features a balcony with panoramic views. The air-conditioned Double Room with Lagoon View offers a seating area and a satellite flat-screen TV. This large room is elegantly decorated and features a balcony with panoramic views. The air-conditioned Double Room with Sea View offers a seating area and a satellite flat-screen TV.